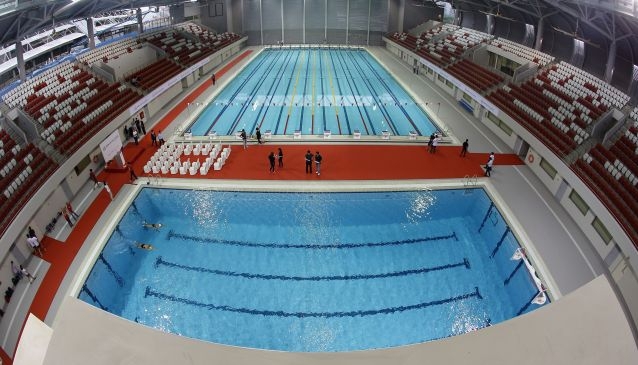 The OCBC Aquatic Centre is designed to play host to international and local aquatic events and offers a full-range of aquatic facilities, built to FINA (Fédération Internationale de Natation) international standards, for swimming, synchronised swimming, diving and water polo. On non-event days, the OCBC Aquatic Centre will be open for use by elite athletes and the public. This centre will also include a water leisure area with learn-to-swim pools and a surf pool that will provide fun-filled water-based recreational activities. With a seating capacity of up to 6,000, it can accomodate a large variety of events and premier aquatic competitions. This premier aquatic centre, which is part of the Singapore Sports Hub, features a 50 metre competition pool, a 50 metre training pool, a 5 metre deep diving pool, a learn-to-swim pool and a surf pool.